What happens when love and politics come into conflict. Brought up in a small Polish village, Ania arrives in the university city of Wroclaw to pursue her career as a sculptor. She falls in love with Dominik, an idealistic writer at the centre of a group of bohemians and avant-garde artists who throw wild parties. When martial law is declared in 1981, their lives change overnight: military tanks appear on the street, curfews are introduced and the artists are driven underground and ultimately in prison. Ania and Dominik fight back, pushing against the boundaries imposed by the authoritarian communist government. But at what cost? When Dominik exposes the deal Ania cut with the government to release her from prison to nurse her dying father, she is devastated and decides to seek asylum. Home Is Nearby examines how artists manage to create exciting work when, officially, they are stripped of artistic freedom. It is also a vivid and intimate exploration of the struggle to find your place in the world, no matter where you are. MAGDALENA MCGUIRE was born in Poland, grew up in Darwin, and now lives in Melbourne, Australia. Her short story Salt Madonna was the winner of the 2017 MSlexia short fiction competition. Her other short stories have been published internationally by The Big Issue, The Bristol Prize, and Margaret River Press. Magdalena has also written widely on human rights topics, including women’s rights and the rights of people with disabilities. 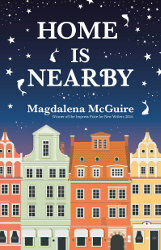 Home is Nearby is her first novel in which she explores the country she could have grown up in but didn’t.